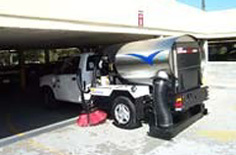 Metro Jackson's premier parking lot sweeping and exterior maintenance company servicing over 150 commercial properties per month. 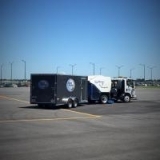 Since 2004 Crystal Clean Sweeping has professionally swept over 150,000 parking lots and pressure washed over 2.5 million square feet of surfaces. We understand that the overall appearance of your facility has a direct impact on your business and we are dedicated to improving the visual appeal of each facility we service! 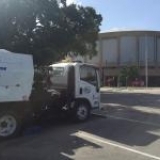 Our cutting-edge power sweeping equipment will effortlessly remove paper, leaves, gravel, and other unsightly debris from all your parking areas, curbs, and driveways. We also blow off the sidewalks and replace the trash can liners in all exterior trash receptacles. We have specialized equipment needed to perform various types of exterior cleaning. Our team has the largest fleet of parking lot sweepers in the state. Our management team provides frequent inspections of each facility we clean to ensure quality services are provided to our clients. We are on-call to serve our clients 24 hours a day, 7 days a week, 365 days a year. Every business is different, so why have the same exterior maintenance program? We will look at your specific needs and develop a plan that will work best for your facility and your budget. To learn more about our experienced cleaning crew, please click the website link on the right. Then get in touch with our commercial cleaners in Metro Jackson, Mississippi, to schedule your free no-obligation quote.